Divorces are often bitter, drawn-out disputes but sometimes spouses can reach agreement and separate amicably. When this happens, Ohio law allows couples to jointly file for what is called a "dissolution of marriage." This is a no-fault version of divorce for spouses who are in complete agreement regarding how to end their marriage. 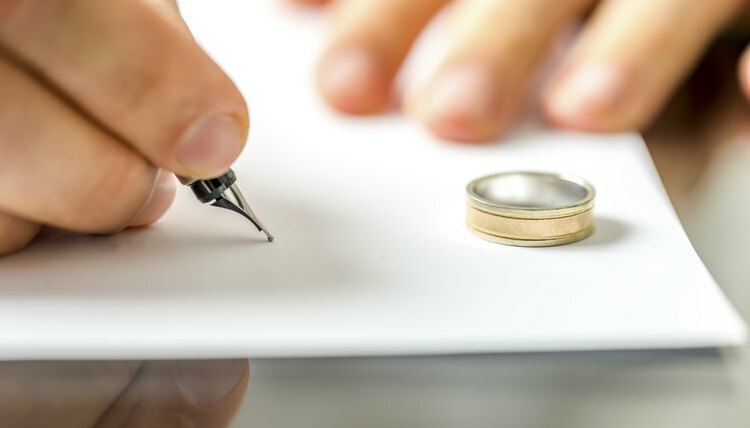 The couple can waive many formalities that can slow down the traditional divorce process, resulting in a quicker and less cumbersome severing of the marital relationship. Before you get started on filing for a dissolution of marriage in Ohio, you must make sure that you and your spouse are eligible. One of you must have lived in Ohio for at least six months before you can pursue either a divorce or dissolution of marriage. You and your spouse must reach and write up a separation agreement before you file any paperwork for dissolution of your marriage. You can obtain these forms from online legal document providers or write one yourself. The separation agreement spells out exactly how you wish to divide your property, including real estate, automobiles, bank accounts and life insurance. You must also address how you're going to divide your debts and whether either of you will pay spousal support — also called alimony — to the other. If you have minor children, you should include a custody arrangement and child support amount. The separation agreement must be signed by both of you and be notarized. After you've completed your separation agreement, you must then obtain a form from the court or a legal document provider called a "Petition for Dissolution of Marriage." This form is short and acknowledges that you meet the residency requirement. It includes the date and location of your marriage and notes that the manner in which you want to resolve property, custody, and support is contained in an attached separation agreement. As part of the petition, you must fill out a Financial Disclosure Affidavit. The affidavit is a sworn statement listing your respective incomes, assets and expenses. You must include several additional "waiver" documents with the dissolution packet when you file your paperwork with the court. These are short and typically just require your signatures. The first is a Waiver of Service, which acknowledges that you have received a copy of the dissolution documents and you forgo your right under Ohio law to have the divorce paperwork physically delivered to you. You also need a Waiver of Venue, which gives up your right to object to the dissolution being filed in the wrong court. Next is a Waiver of Representation, which simply indicates that you and your spouse are aware that you could have hired attorneys but chose not to. You must complete a Waiver of Fourteen Day Objection Period, a document that states that you give up the two-week period of time provided for under state law to object to the terms of the separation agreement. If you include this document, your dissolution will become final more quickly. You must also include a property division waiver and a financial waiver, stating that you're happy with your agreement's terms regarding property without an independent determination from the court. The final document you must file is the actual dissolution decree. When this is signed by the judge, it officially severs your marital relationship. After you've filed all your paperwork, the court will hold a hearing — usually within 30 to 90 days after filing — and review your agreement and paperwork for completeness. The judge will then sign the decree, which will finalize the dissolution, and you will be bound by the terms of the separation agreement. Thomas, Wayne. "Forms for Dissolution of Marriage in Ohio." , https://legalbeagle.com/5994213-forms-dissolution-marriage-ohio.html. 21 March 2017.